How to draw a polar bear part 2. Jump to part one if you came to this page first! In part two you will complete your polar bear drawing by using shapes to draw the polar bear's upper body, lower body and powerful legs. 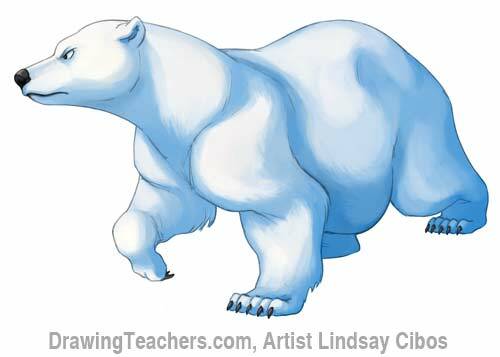 Lindsay shows you how to refine and detail your drawing and finally how to color your drawing of a polar bear. 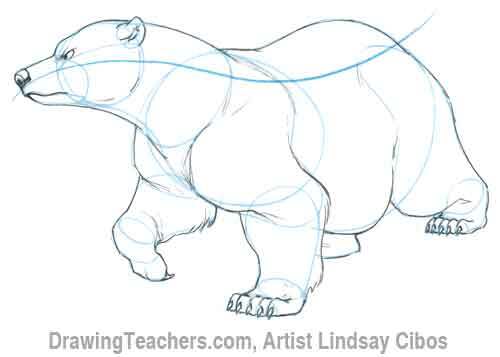 Now let's continue with the "How to Draw a Cartoon Polar Bear"
Curving around the neck, draw the bear's large, muscular shoulders. From the shoulders, draw the arms, divided into upper and forearm segments. Then add the paws. 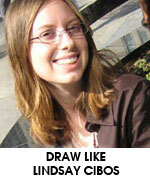 Draw an oval eye resting on the horizontal guideline of the face. Above the eye, sketch his brow bumping out from the top of the head. Place the ear towards the back of the head, also on the horizontal guideline. 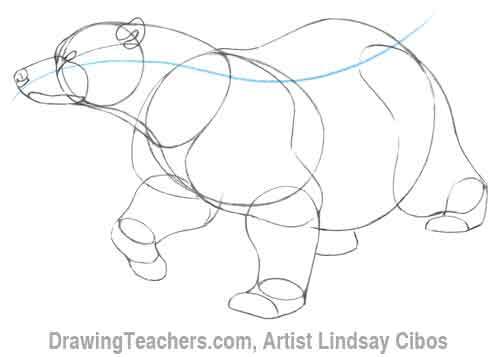 From the center point of the bear's face, sketch a rectangular muzzle, then add a nose and fierce mouth. 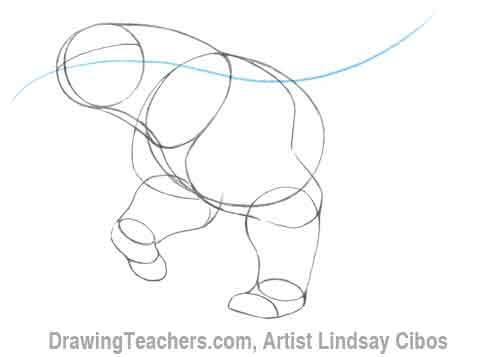 Draw a barrel shape for the rest of the polar bear's torso. Then build up the pelvis and hind legs. Divide each of the paws into five individual toes. Sketch a curved claw in the center of each toe. Then detail the bear's eye with the iris. Tighten and darken your lines. 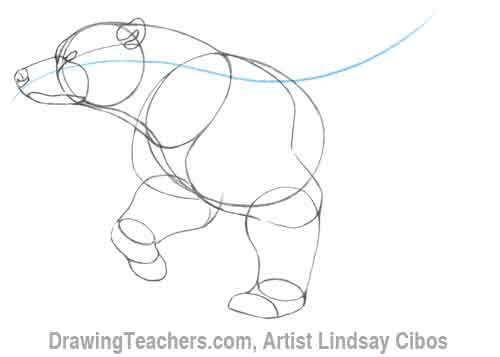 Use broken lines to fluff up the bear's elbows, wrists, and body. Erase any construction guidelines. Fill in his nose and eyes with pencil shading. Now to color your fierce ice bear. Interestingly, polar bear fur appears white, but is actually transparent. Bring out the bear's volume with a shadow tone. Uses blues for a cold, serious mood. Creamy yellows are another option. Add some jagged strokes for furry texture and you’re done!